When Christopher Columbus dropped anchor on the shores of San Salvador in the Caribbean Sea, he believed he reached India. Because he believed he was in India, Columbus named the inhabitants Indians, a term that was soon used to refer to all the native inhabitants of North America. Today, the term Native American is more commonly used. SOURCE : Broussard, et al. (1991). 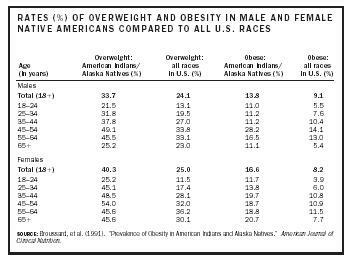 "Prevalence of Obesity in American Indians and Alaska Natives." American Journal of Clinical Nutrition . not go hungry as the settlers did. The Native Americans were skilled agriculturists, nomadic hunters, and food gatherers who lived in relatively egalitarian communities where both the women and men had equal responsibilities. The portal that Columbus opened when he first stepped foot on the soil of the New World in 1492 triggered a steady influx of European settlers, indelibly affecting the lives of Native Americans. However, it was Thomas Jefferson's purchase of the Louisiana Territory from France in 1803 that fundamentally changed the course of Native Americans' future in North America. Hoping to expand the nation's size, Jefferson urged the Creek and Cherokee nations of Georgia to relocate to the newly acquired land. This began an era of devastating wars over land. The many years of struggle between Native American tribes and the U.S. government resulted in the near extinction of many Native American tribes. The Native American population, including American Indians and Alaska Natives, once totaled nearly 24 million, with over 500 tribes. The diets of Native Americans varied by geographic region and climate. They lived in territories marked by specific natural boundaries, such as mountains, oceans, rivers, and plains. Hunting, fishing, and farming supplied the major food resources. Native Americans survived largely on meat, fish, plants, berries, and nuts. The most widely grown and consumed plant foods were maize (or corn) in the mild climate regions and wild rice in the Great Lakes region. A process called nixtamalizacion (soaking dry corn in lime water) was used to soften the corn into dough, called nixtamal or masa. This was prepared in a variety of ways to make porridges and breads. Many tribes grew beans and enjoyed them as succotash, a dish made of beans, corn, dog meat, and bear fat . Tubers (roots), also widely eaten, were cooked slowly in underground pits until the hard tough root became a highly digestible gelatin-like soup. It is estimated that 60 percent of modern agricultural production in the United States involves crops domesticated by Native Americans. Maple sugar comprised 12 percent of the Native American diet. The Native American name for maple sugar is Sinzibuckwud (drawn from the wood). Sugar was a basic seasoning for grains and breads, stews, teas, berries, vegetables. In the Southwest, the Native Americans chewed the sweet heart of the agave plant. Many tribes preferred broth and herbed beverages to water. The Chippewa boiled water and added leaves or twigs before drinking it. Sassafras was a favorite ingredient in teas and medicinal drinks. Broth was flavored and thickened with corn silk and dried pumpkin blossoms. Native Americans in California added lemonade berries to water to make a pleasantly sour drink. Sacred foods included bear, organ meats, and blood soup. The Horns Society, a militant group of the Blackfoot Nation, used pemmican, made with berries, for its sacred communion meal. Boiled buffalo tongue was a delicacy and was served as the food of communion at the Sun Dance, a Lakota and Plains Indian courtship dance that also celebrated the renewal of spiritual life. Blood soup, made from a mixture of blood and corn flour cooked in broth, was used as a sacred meal during the nighttime Holy Smoke ceremony of the Sioux, a celebration of Mother Earth that involved the use of the "peace pipe." Wolves and coyotes were the only animals that were not hunted for food, because they were regarded as teachers or pathfinders and held as sacred by all tribes. At marriage ceremonies, the bride and groom exchanged food instead of rings. The groom brought venison or some other meat to indicate his intention to provide for the household. The bride provided corn or bean bread to symbolize her willingness to care for and provide nourishment for her household. Native American diets and food practices have possibly changed more than any other ethnic group in the United States. Although the current diet of Native Americans may vary by tribe, and by personal traits such as age (e.g., young versus old), it closely resembles that of the U.S. white population. Their diet, however, is poorer in quality than that of the general U.S. population. A recent study found that only 10 percent of Native Americans have a healthful diet, while 90 percent have a poor quality that needs improvement. The majority of Native Americans have diets that are too high in fat (62%). Only 21 percent eat the recommended amount of fruit on any given day, while 34 percent eat the recommended amount of vegetables, 24 percent eat the recommended amount of grains, and 27 percent consume the recommended amount of dairy products. Native Americans are also four times more likely to report not having enough to eat than other U.S. households. 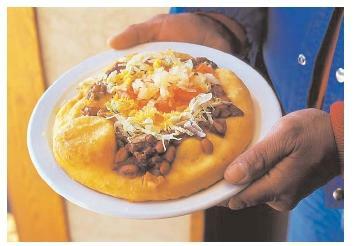 The frybread taco is a relatively recent addition to Native American fare. It requires white wheat flour, which came to the New World with Europeans. Heart disease is the leading cause of death among Native Americans. Risk factors, such as high blood pressure , cigarette smoking, high blood cholesterol , obesity , and diabetes , are health conditions that increase a person's chance for having heart disease. The more risk factors a person has, the greater chance a person may have for developing heart disease. Sixty-four percent of Native American men and 61 percent of women have one or more of these risk factors. Type II Diabetes is one of the most serious health problems for Native Americans in the United States. It is estimated that 12.3 percent of Native Americans over nineteen years of age have type II diabetes, compared to about 6 percent of the general U.S. population—a statistic that has caused health experts to say diabetes has reached widespread proportions. On average, Native Americans are 2.8 times more likely to be diagnosed with diabetes than whites of a similar age. Diabetes is a major cause of health problems and deaths in most Native American populations. Diabetes rates for Native Americans vary by tribal group. Obesity is a major risk factor for both type II diabetes and heart disease. On average, 30 percent of all adult Native Americans are obese . Both males and females are consistently more overweight and obese than the total U.S. population. Among the Pima of Arizona and Mexico, for example, 95 percent of those with diabetes are also overweight. In addition to the increase in obesity among adults, obesity in children has also become a serious health problem. For both adults and children, the increasingly high rates of obesity have been associated with a high-fat diet and decreased levels of physical activity. The history of the Native American people provides evidence of a culture strong enough to withstand the most difficult hardships. Though their lives were changed in many ways over the centuries, their cooking and eating traditions have become mainstays of contemporary American cuisine. Many Native American recipes have been adopted by white populations in different regions in the United States, including succotash in the South, wild rice dishes in the northern Plains, pumpkin soup in New England, chili in the Southwest, broiled salmon in the Pacific Northwest, and corn on the cob in most areas of the country. Indeed, Native Americans have influenced American cuisine in ways the white population has yet to acknowledge. Of greater importance, however, is the dire need to focus on the failing health of Native Americans. For complex reasons, Native Americans have not had the opportunity to access health care in ways that other Americans have. This has caused serious health problems. The limitations imposed on their living conditions, in concert with the socioeconomic obstacles that Native Americans face, challenge their livelihood. Though some programs have begun to target Native Americans' health problems, their future depends on receiving proper care for modern-day diseases. SEE ALSO Corn- OR Maize-Based Diets . Brill, Steve, and Dean, Evelyn (1994). Identifying and Harvesting Edible and Medicinal Plants. New York: Hearst Books. Centers for Disease Control and Prevention (2000). "Prevalence of Selected Cardiovascular Disease Risk Factors by Sociodemographic Characteristics among American Indians and Alaska Natives." Morbidity and Mortality Weekly Report. Fiple, Kenneth F., and Coneè Ornelas, Krimhil, eds. (2000). The Cambridge World History of Food, Volumes 1 and 2. Cambridge, U.K.: Cambridge University Press. Gohdes, D. (1995). "Diabetes in North American Indians and Alaska Natives." In Diabetes in America. Bethesda, MD: National Institute of Diabetes and Digestive and Kidney Diseases, National Institutes of Health. Greaves, Tom, ed. (2002). Endangered Peoples of North America: Struggles to Survive and Thrive. Westport, CT: Greenwood Press. Jennings, Francis (1975). The Invasion of America: Indians, Colonialism, and the Cant of Conquest. New York: W. W. Norton. Jennings, Jesse D., ed. (1978). Ancient Native Americans. San Francisco, CA: W.H. Freeman. Kavasch, Barrie (1977). Native Harvests: Recipes and Botanicals of the American Indian. New York: Vintage Books. Lytle, L. A.; Dixon, L. B.; Cunningham-Sabo, L.; Evans, M.; Gittelsohn, J.; Hurley, J.; Snyder, P.; Stevens, J.; Weber, J.; Anliker, J.; Heller, K.; and Story, M. (2002). "Dietary Intakes of Native American Children: Findings from the Pathways Feasibility Study." Journal of American Dietetic Association 102(4):555–558. National Institute of Diabetes and Digestive and Kidney Diseases (1995). The Pima Indians: Pathfinders for Health. Washington, DC: U.S. Government Printing Office. Penner, Lucille Recht (1994). A Native American Feast. New York: Macmillan. United States Department of Agriculture, Center for Nutrition Policy and Promotion (1999). "The Diet Quality of American Indians: Evidence from the Continuing Survey of Food Intakes by Individuals." Nutrition Insights 12. Wolf, B. (1980). The Ways of My Grandmothers. New York: William Morrow. Zinn, Howard (1980). A People's History of the United States. New York: Harper Collins.